Creating and solving Sudoku and Puzzles is my hobby, so on daily basis, I keep on creating and posting puzzles on this website. Most of the puzzles and Sudoku posted here are created here. However sometimes Guest Authors also contribute here. Previous around 3 authors contributed on this blog. Now new author Avina will be contributing some Sudoku puzzles here. These Sudoku will be posted for Daily Sudoku League and Guest Authors Puzzles Series. Classic Sudoku Rules apply. 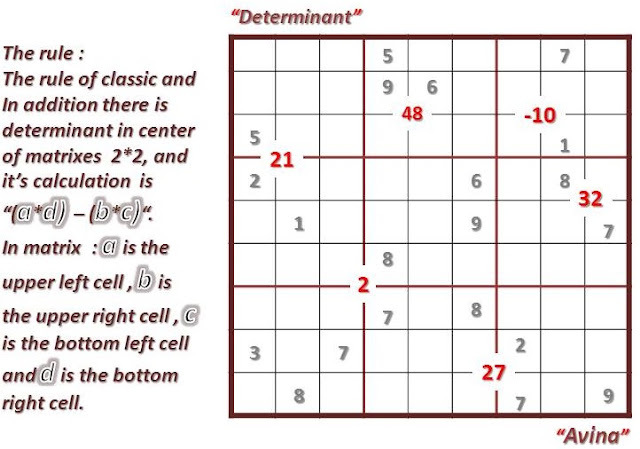 Additionally there is determinant in center of 2x2 matrix cells and the calculations is "(a*d)-(b*c)". In matrix: a is the upper left cell, be is upper right cell, c is the bottom left cell and d is the bottom right cell.